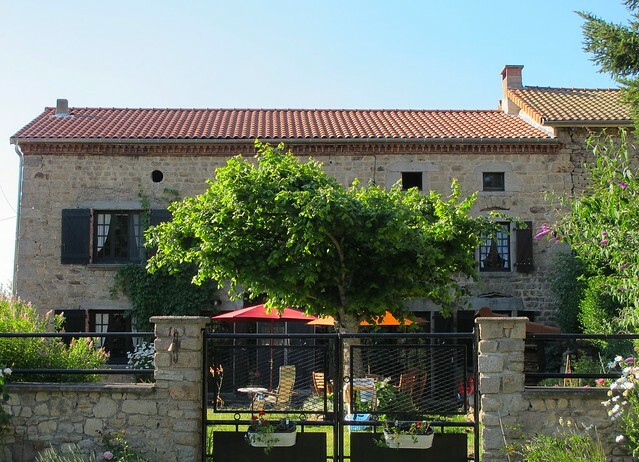 What do you get an old stone farm house in the Auvergne region of France for its 150 year old birthday? 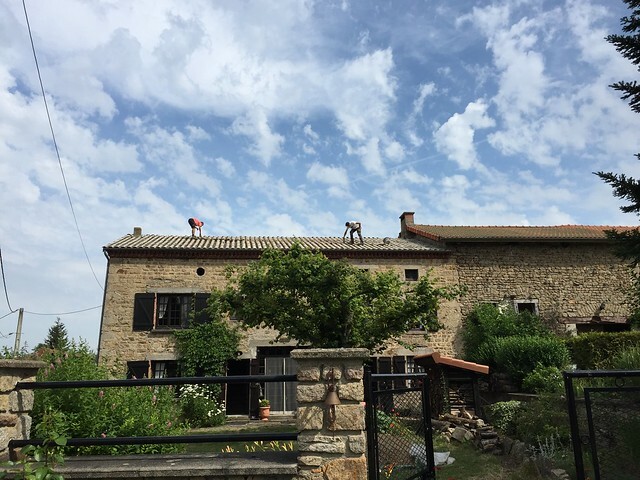 A new roof, complete with new beams and new clay tiles, of course. This way, it can weather the next centennial and hopefully bring joy to many more generations of my family. 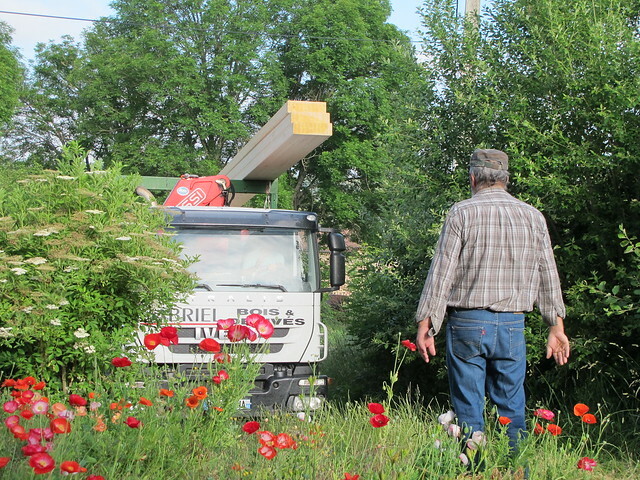 My husband and I had planned for the work last year, consulting with Pascal, the best roofer and carpenter in the area. 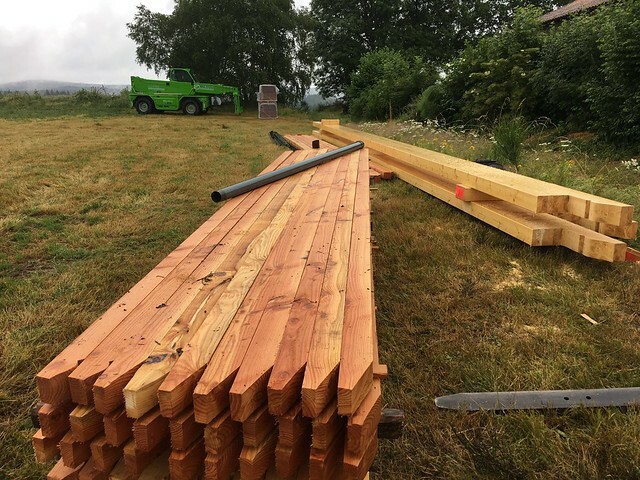 Over the years, Pascal and his wife have become wonderful friends and there is no one else we would trust more to undertake such a large project. 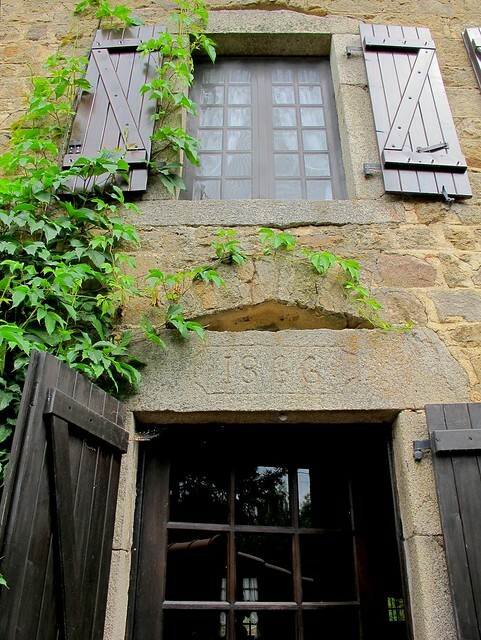 We knew that our 1866 home was in the best of hands. 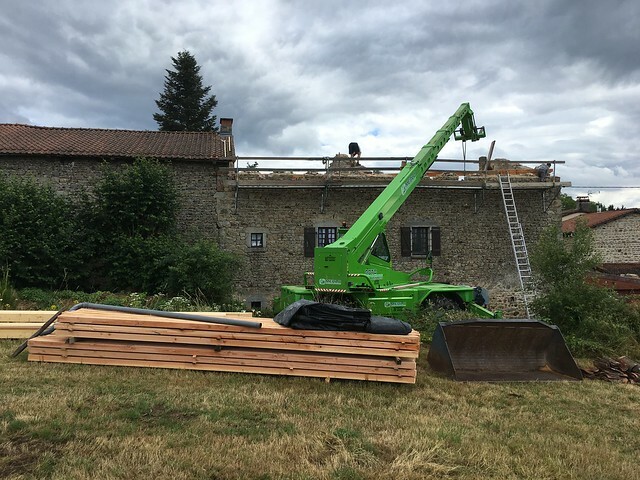 We had hoped that Pascal could fit in the work during the time we were here in the Auvergne this summer, but were prepared to make a special trip this fall or next spring if necessary. However, shortly after we arrived here a few weeks ago, Pascal came by to tell us that his crew would begin work the very next week. My husband and I were ecstatic. This would mean that my 84 year old father, who bought this house in 1971, will be able to see it completed when he comes here in August. 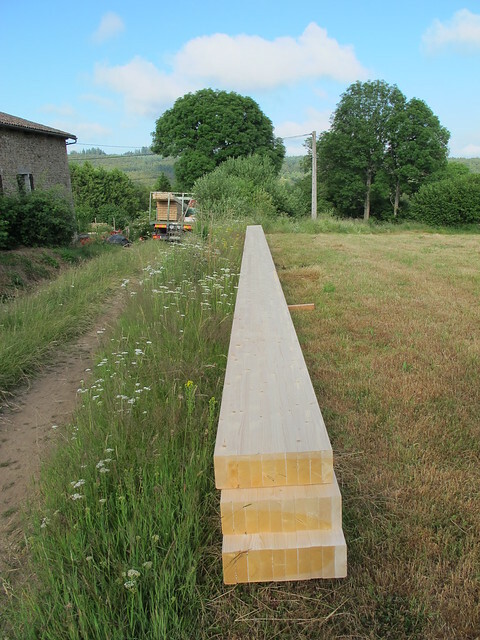 Shortly after Pascal's visit, three 15 meter beams were delivered behind the house. 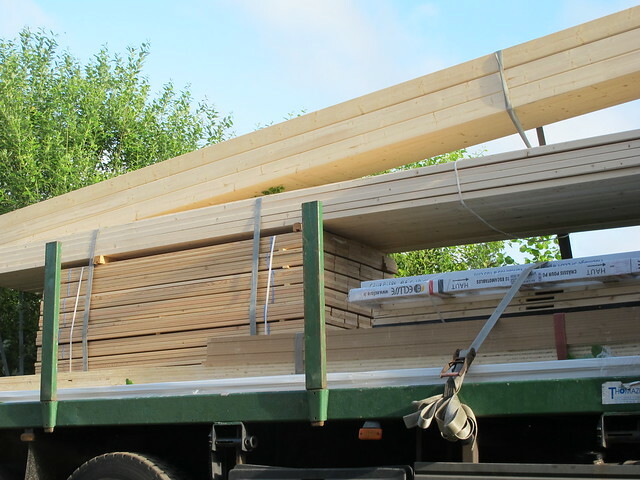 More wood deliveries followed. 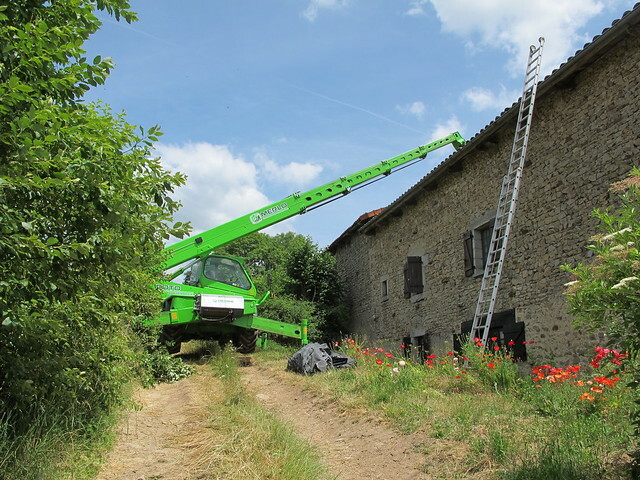 A crew of five showed up a few days later with a huge green machine with a telescopic arm. 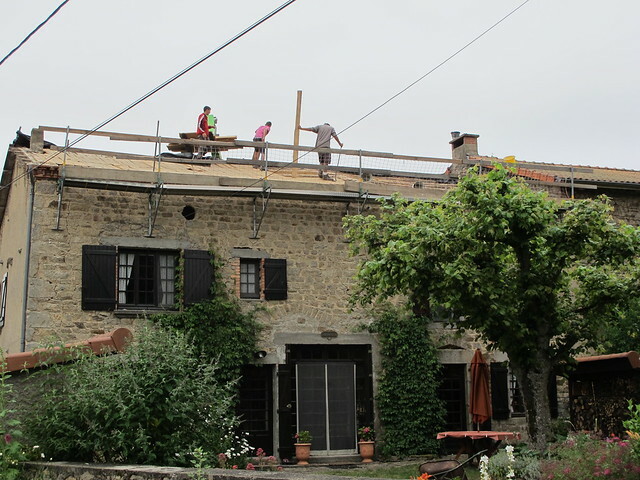 After three days of work, the old roof was completely dismantled. The house looked like a ruin. 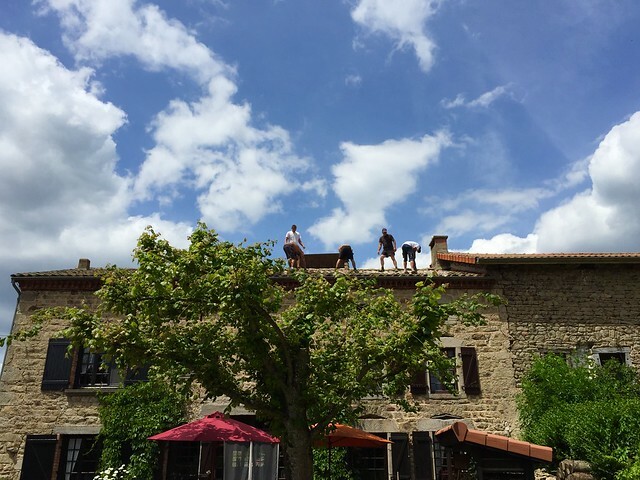 It was a bit disconcerting, especially since the Bastille Day holiday week-end meant that no work would be done for four days and we would have to spend them without protection from the elements. 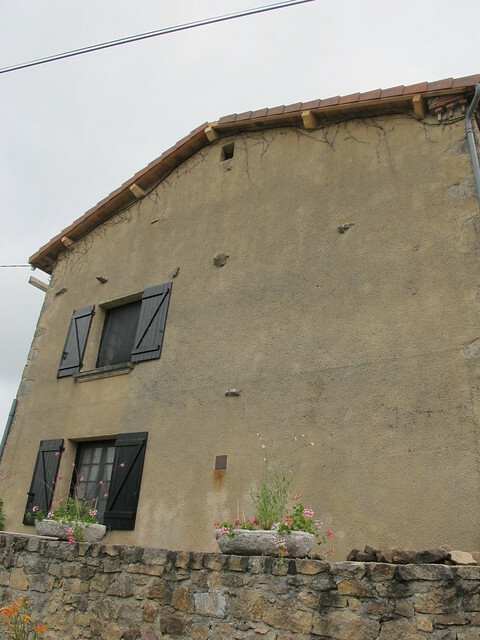 Of course it rained on one of these days, but that was to be expected here in the Auvergne, where the weather changes as frequently as in Ireland. 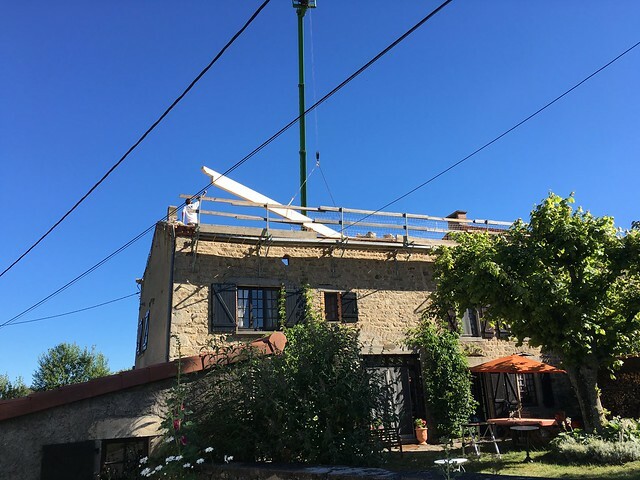 Last Monday, the team resumed work, lifting all the beams in place, covering them with wood planks, adding an impermeable membrane, and cementing all the holes left by some of the old beams. 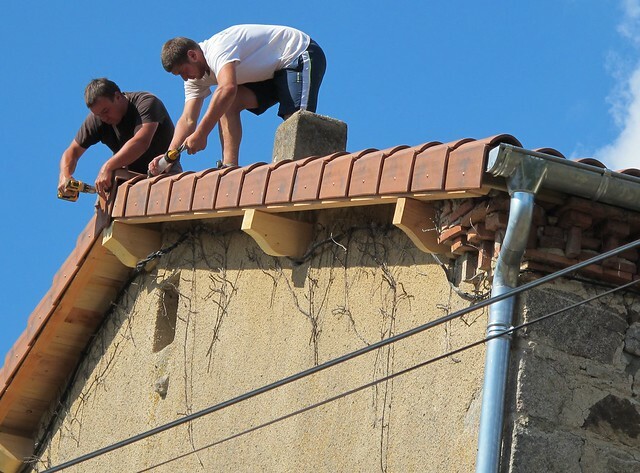 By Friday, they started putting the clay tiles on the roof. It was impressive to watch. 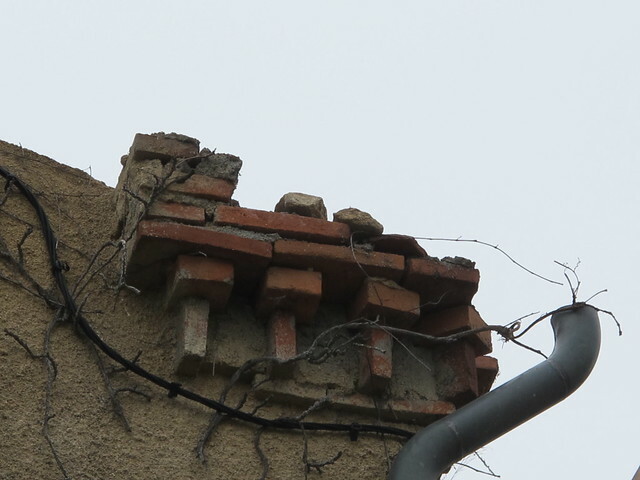 And then, yesterday, the gutters and the last medallion tile was affixed to the peak of the roof. 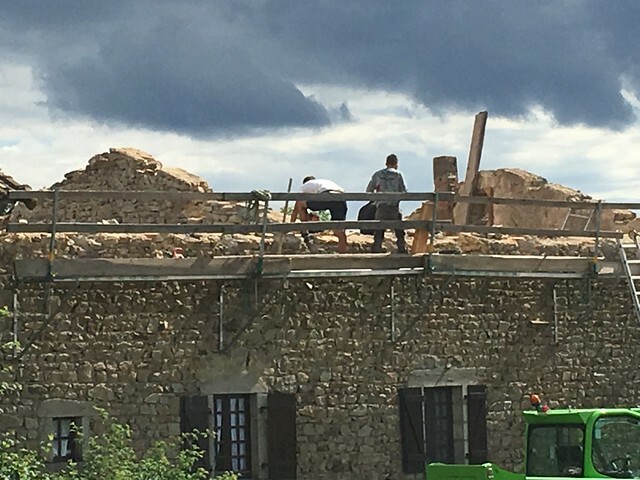 After a last Pastis with the crew, we asked them all to sign one of the beams and write down the date of completion: Le 25. Juillet, 2016. 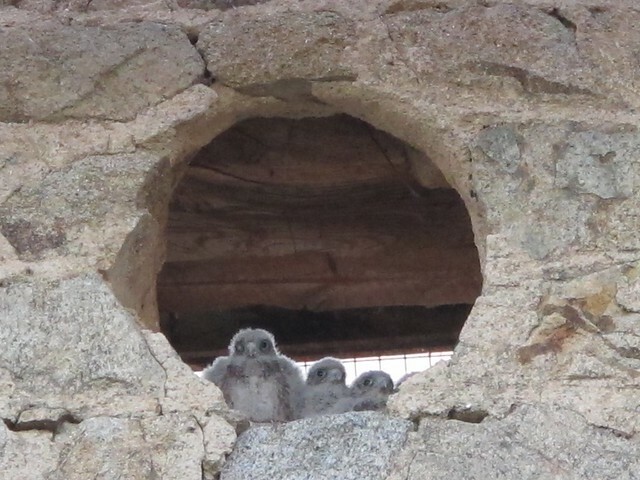 Four baby falcons had hatched in one of the attic windows shortly before the work began. 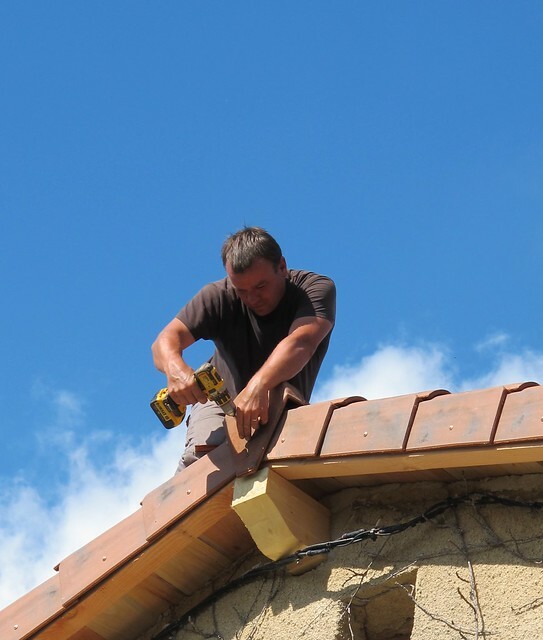 Because the nest was located right below where the central beam was to be installed, the nest and the chicks needed to be transferred to another attic window. i think that was the most stressful part of the construction, holding our breath until the falcon parents located the chicks and started feeding their babies again. All is well with the little ones and they are thriving. 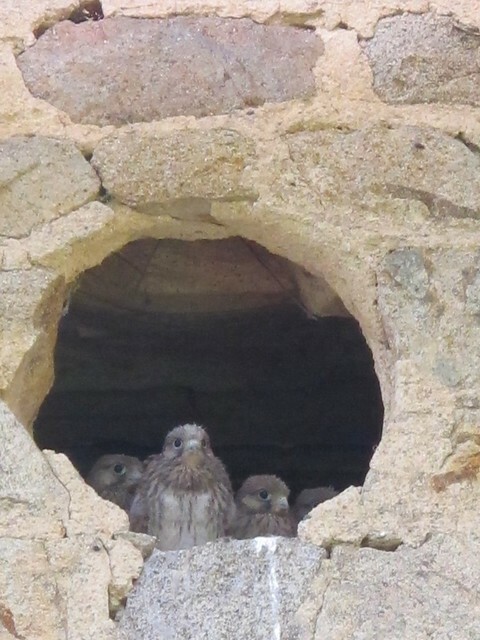 After all this work, quiet has returned to our hill and I think the little falcons will be leaving the nest soon. looks very lovely. must be nice to have upgrades to an old home with good bones. was just in málaga for a few days. love that city and how it's changed for the better over the years. Chance Bliss, thank you. Saw your lovely photos of Malaga on Instagram. Lovely. 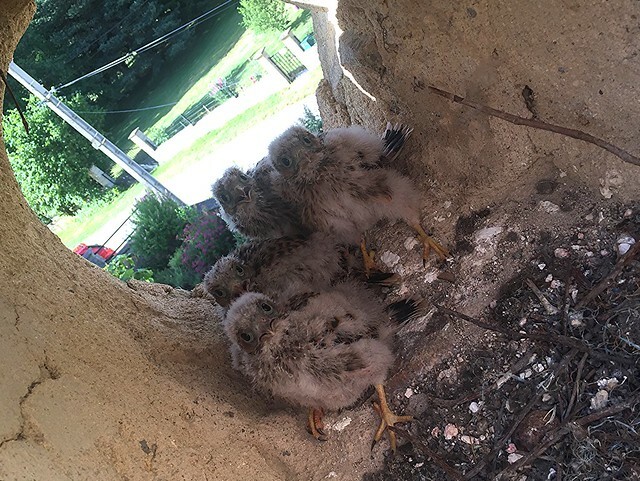 How did you manage to move those hawk chicks? Amazing! 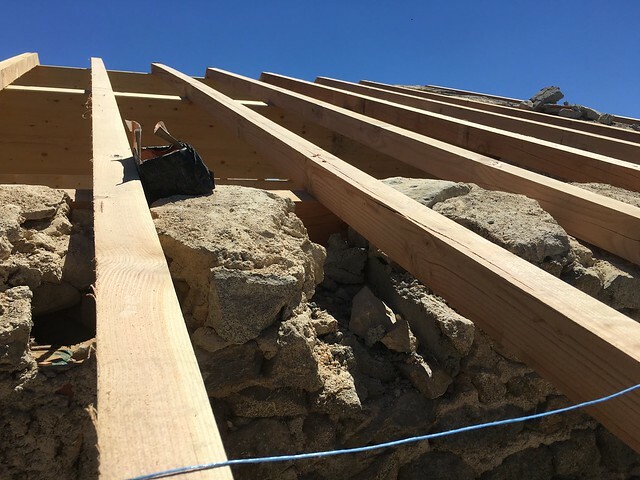 Bood bones, good roof, your house is set! Maybe now you'll be able to relax for a while. Loved seeing the crew work. Materials look really good quality, too! Thanks, Anon. 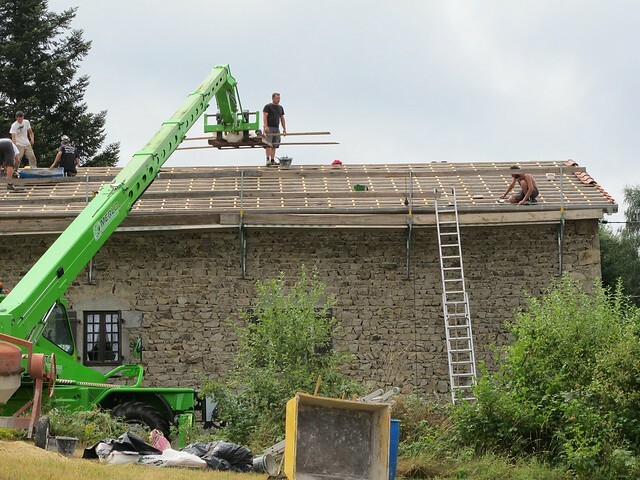 With any look, this roof will last for 30-50 years. 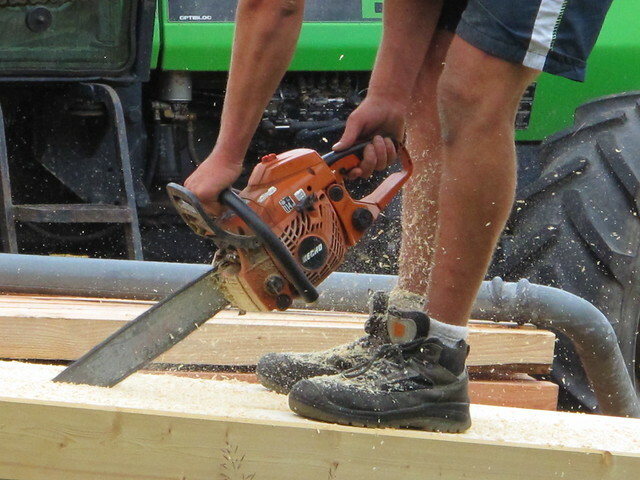 The beams should last much longer. The original ones lasted 150. One of the workers climbed a ladder to the nest and lifted it and the chicks out to the other window around the front of the house. Frankly, I am amazed he succeeded to transport all four without accident. I hear them chirping right now. They are almost as big as the mother now and I think they will fly off soon. It has been quite wonderful having them live so close. Yes, vacation will start now, though we do still have odd jobs to do around the house. 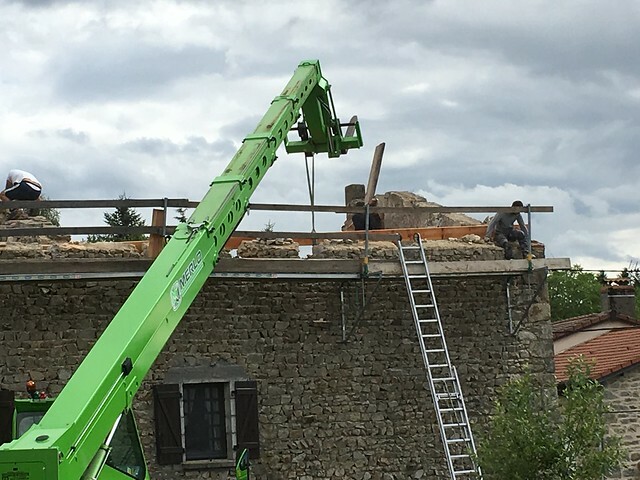 I guess its 'workation' for us here in France. Wow! You guys are sure taking great care of the house! Your love for it comes through every pic! Had no idea you had such big jobs this visit. 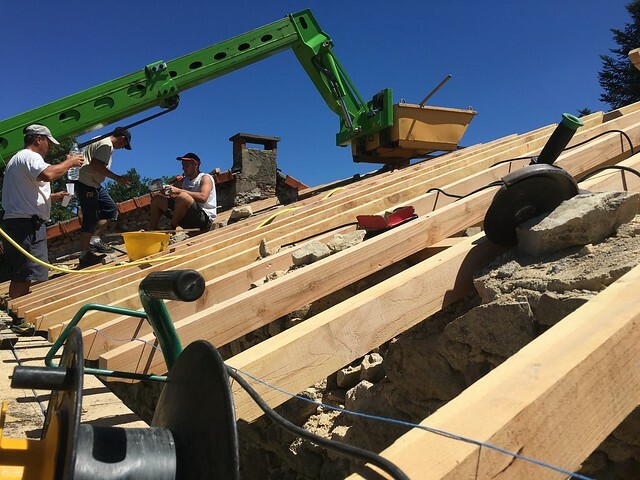 Roof looks wonderful! The pics of the chicks are the best. LOVE how they are looking at the camera as If to say "hey, whatcha looking at?" Priceless! Please tell me you guys can enjoy some downtown now! Mrs. Sam. the house is all cleaned up after the major work and we are relaxing in the sun as I write this. The roof was a biggy and I am relieved its over. Market pictures will be posted soon.